There has never been a time when Paul Pierce’s wife has not been beside him showing her support. Flanked by his wife Julie Pierce and their kids, Pierce saw his Boston Celtics jersey join the rafters. Although the Boston Celtics lost to the Cleveland Cavaliers on February 11, 2018, the mood was still celebratory. The Celtics retired small forward Paul Pierce’s No. 34 jersey to the rafters! Joined by his family, Pierce got a little choked up talking about their support. And, his fans are aware that Julie Pierce has supported her husband all the way. Read all about this amazing WAG right here, with details from Julie Pierce’s wiki. Julie Pierce, age 34, is an interior designer. 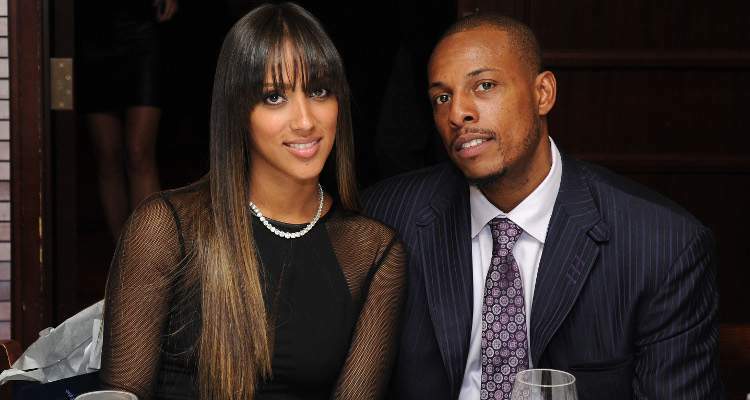 She and the former NBA small forward began dating in 2005. They began dating during the All-Star Weekend that year and had known each other before that. Back in the 2007 season, the Celtics acquired Ray Allen and Kevin Garnett. Together with Pierce, they were dubbed the “Big Three” and were the strongest contenders for the NBA Championship. But winning a championship was harder than Pierce thought. He confessed that he had a lot on his mind during the 2007 season. The basketball player then sat down with team execs to trade him to another team. But they convinced him to stay. Before her relationship with the basketball star, Julie Pierce was already familiar with the NBA scene. She was first introduced to the league thanks to her previous boyfriend, Larry Hughes, the former Cleveland Cavaliers player. However, Pierce didn’t know that Hughes was married to his current wife, Carrie Hughes, when they were dating. She reportedly found out that she was the other woman and ended the relationship. Pierce was able to move on with one of the best players in the NBA. Paul and Julie Pierce’s relationship developed quickly, and they moved in together shortly after. The Big Three’s legendary friendship was evident when the Pierces became parents. Paul Pierce had said that Garnett convinced him not to let the team’s streak of losses get to him. In October 2007, Pierce, Garnett, and Allen, with their respective partners, were having dinner together when Julie Pierce announced that she was pregnant. A few days later, Garnett and his wife discovered that they were going to be parents, too. Paul and Julie Pierce didn’t announce that they were going to be parents until her baby bump started to show. At that time, the basketball star sent fans into a tizzy when he started referring to his girlfriend as his fiancée! Pierce and Garnett often confided in each other about the responsibilities of fatherhood, given that both grew up with absentee fathers. Their daughters were born two weeks apart in 2008. Prianna Pierce and Capri Garnett are best friends, just like their parents. Their second daughter, Adrian Pierce, was born in 2011. And their son, Prince Pierce (named after the singer), was born in 2013. The Celtics’ player’s wedding made headlines in 2010, especially with the beautiful wedding photos that hit the media. Paul and Julie Pierce tied the knot at The Resort at Pelican Hill in Newport Coast, California, on July 17, 2010. The intimate oceanfront ceremony had 80 guests in attendance, including Kevin Garnett, Celtics coach Doc Rivers, and Pierce’s high school coach, Patrick Roy. Their then two-year-old daughter, Prianna Pierce, was the flower girl. The couple pulled out all stops for their wedding. The bride was a vision in white in an Ines Di Santo gown while Pierce donned a custom élévee tux. A jazz quartet performed at the red-themed wedding (keep the Game of Thrones imagery out, folks.) And the Japanese fare served in a bento box was inspired by the couple’s favorite restaurant in West Hollywood.